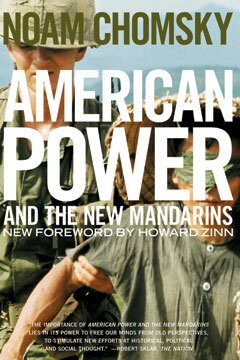 American Power and the New Mandarins is Noam Chomsky’s first political book, widely considered to be among the most cogent and powerful statements against the American war in Vietnam. Long out of print, this collection of early, seminal essays helped to establish Chomsky as a leading critic of United States foreign policy. These pages mount a scathing critique of the contradictions of the war, and an indictment of the mainstream, liberal intellectuals—the “new mandarins”—who furnished what Chomsky argued was the necessary ideological cover for the horrors visited on the Vietnamese people. As America’s foreign entanglements deepen by the month, Chomsky’s lucid analysis is a sobering reminder of the perils of imperial diplomacy. With a new foreword by Howard Zinn, author of A People’s History of the United States, American Power and the New Mandarins is a renewed call for independent analysis of America’s role in the world.